From past couple of days there has been continuous debate on the issue "Whether SSC CGL 2016 Tier-I Qualifying or not". Even we recieved many msgs regarding this. In this post will try to clear your doubts with proper references. 1) SSC CGL 2016 Notice dated 13-02-2016 Said The Commission reserves the right to make changes in the scheme of examination. 2) SSC Uploaded revised Scheme of Examination for CGL -16 on 01-07-2017 and emphasized that The final merit will be prepared on overall performance in Tier-I, Tier-II and Tier-III. 3) SSC Uploaded Notice on 20-07-16 and Further elaborated The final merit of the successful candidates would be determined on the basis of total score obtained by them in Tier-I, Tier-II and Tier-III. 4) In views of Former Chairman K N Raghupathy There are court rulings that any decision to treat an examination qualifying in nature should be notified before the examination is held. (Tier 1 cant be made qualifying after exam has been conducted). 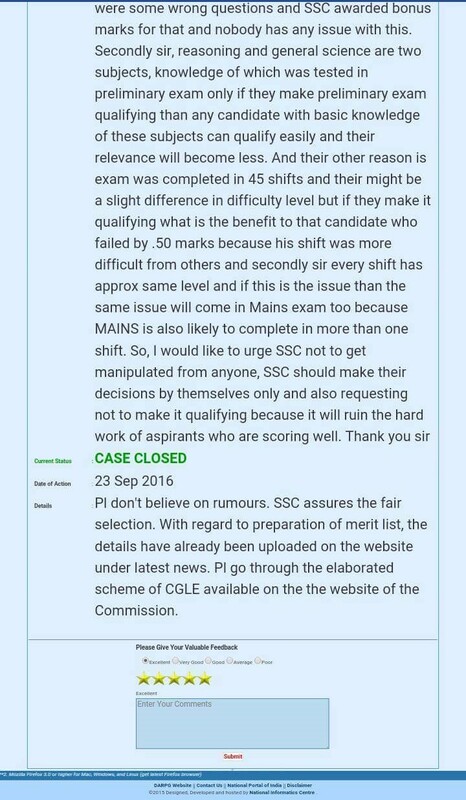 5) Latest CPGRAM Reply Dated 23-09-2016 SSC Assured that its Just Rumors and candidates are advised not to believe in that. SSC Assures the fair selection and refers to the earlier Notices uploaded by SSC in its website under Latest News. 6) Qmaths View: SSC CGL cannot be made qualifying, Tier 1 marks will be added in final merit, Aspirants are advised to avoid misguidance and concentrate on preparation of Tier 2 rather than wasting time. 9.1 The Commission reserves the right to make changes in the scheme of examination such as conduct of Tier-I and Tier-II examination in computer based mode, treating Tier-I examination as only qualifying etc. In accordance with Para No. 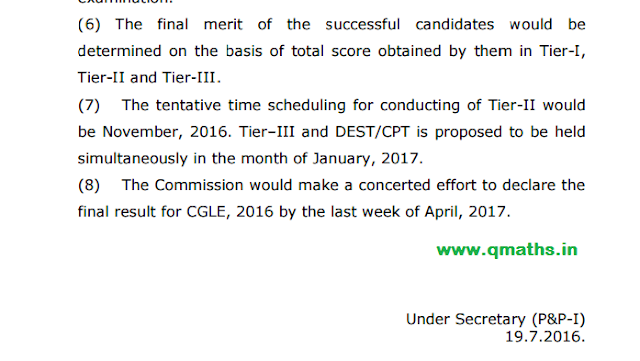 9.1 of the Notice, the Commission had reserved the right to make changes in the scheme of examination such as conduct of Tier-I and Tier-II examination in computer based examination mode, treating Tier-I examination as only qualifying etc. The final merit will be prepared on overall performance in Tier-I, Tier-II and Tier-III. However, the candidate will need to qualify all the tiers i.e. Tier-I, Tier-II and Tier-III separately. There will be no sectional cut-off. It is to be noted that SSC has changed the pattern but nowhere mentioned that Tier 1 may be made qualifying in revised scheme. (17) The marks obtained by the candidates in Tier I & Tier II, together, would determine the eligibility of the candidates to appear in Tier III & Tier IV. (6) The final merit of the successful candidates would be determined on the basis of total score obtained by them in Tier-I, Tier-II and Tier-III. 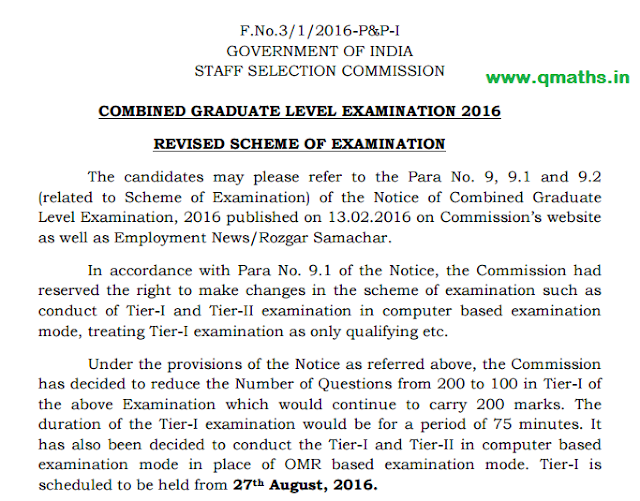 This clarified the para "The final merit will be prepared on overall performance in Tier-I, Tier-II and Tier-III." of Revised Pattern of SSC CGL Notice dated 01-07-2016. Former SSC Chief K N Raghupahy says that There are court rulings that any decision to treat an examination qualifying in nature should be notified before the examination is held. Any decision thereafter may be construed as favoring the candidates who secure marks just adequate to meet the cut-off and may lead to court cases as violation of natural justice. In the case of CGL 2016 Tier is finished and before conducting Tier 1, SSC in its Revised Notice dated 01-07-2016 along with 20-07-2016 Cleared that Tier 1 marks will be added. Now at this time it is impossible to make it qualifying as it will lead SSC into legal troubles. Someone Filed a CPGRAM on this issue and in reply SSC Assured that its Just Rumors and candidates are advised not to believe in that. SSC Assures the fair selection and refers to the earlier Notices uploaded by SSC in its website under Latest News.